Home » Italy » What Happens When You Pull a Bathroom Cord in Italy? What Happens When You Pull a Bathroom Cord in Italy? Travelers and tourists have long been perplexed by cords which hang from Italian bathrooms. What happens if you pull them? Well, after being stormed by police while bored on the toilet, one curious (and embarrassed) woman recently found out. Italian law actually requires that an emergency cord hang from all public toilets. Basically, they are intended as the Italian version of the infamous “I’ve fallen and I can’t get up” life alert system. Ideally, if you pull the cord, someone of authority should immediately rush to your assistance. Despite the law, there is apparently some ambiguity regarding the proper response if one is pulled. 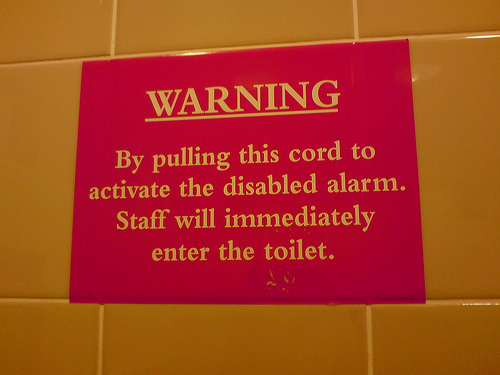 Often times nothing happens at all, likely as a result of the ‘never cry wolf’ syndrome (could there be anything more enticing to a prankster than a cord dangling over a toilet?). But for one traveler, who reported the incident via twitter (@Moscerina)– yes, twitter– pulling the cord prompted a machine-gun holding carabinieri to charge into the bathroom to investigate. Although we suspect that this incident is the exception rather than the rule, it’s enough for us to implore to all travelers: as a general rule, it’s probably best to avoid pulling mysterious strings while tweeting on the loo. I’m pretty sure that this cord signal is intended also for cases where a stranger barges into the bathroom and attacks the person in there–such as an unsuspecting woman. This is one of the funniest stories I have heard in a long time ! Being a world traveller myself, I have almost seen and heard everything ! this is right up there with “donkey knocks picture taker off cliff in turkey and doney rider sues”…. Haha This happened to my daughter who pulled the wrong cord at a Uk University, set off the fore alarm and had the Uni evacuated.